The Crochet Stitch Handbook fully explains over 200 stitches. A perfect starter guide for beginners, with advanced projects and details for experts, this book is a wonderful addition to the library of any crafter, crocheter, or knitter. The handbook includes step-by-step instructions for basic stitches, textured stitches, fans and shells stitches, mesh and filet stitches, openwork and lace stitches, trims and edgings, clusters, puffs, bobbles, spike, relief, Tunisian, multi-color, squares, and special stitches. Crochet is the technique of making a looped fabric from a continuous length of yarn, using a single hook. The word crochet itself derives from the French croc, meaning a hook (or crook); an old Scottish name for crochet is "shepherd's knitting." It is one of themost portable and flexible of crafts, requiring only a hook and some yarn. Master the basic techniques of crochet, and more, to create a fascinating variety of effects with The Crochet Stitch Handbook. The Crochet Stitch Handbook is a lovely compendium for any crocheter. It features a wide range of stitches, all presented in an easy-to-read, easy-to-follow format. The large number of images, including a pictorial stitch index, is very welcome, as they give you an idea of how each stitch should appear when completed. It's also useful to have introductory information on crocheting for those picking up the book while still new to the craft. 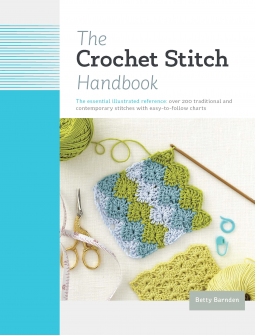 As a recent crochet-newbie myself, I am on the hunt for the best stitch handbook to add to my library, and having now viewed this one, it is definitely a strong contender for purchase, since I liked its clear, no fuss approach. The only thing I wasn't 100% keen on was the printing of the charts in colours. Some were fine, but others could be a bit tough on the eyes. Black, or at least darker shades, might have worked better. Also, in a few of the photos, the stitches aren't as clearly visible as in others. But those are small gripes, and in all other ways, this book provides an excellent resource.